A Pledge to Boycott Israel and Isreali Products if Israel Bombs Iran. Click here to read and sign the pledge. Are you worried about a preemptive Israeli attack on Iran dragging the US and the entire Middle East into yet another war? Do you feel helpless in the face of our so-called elected officials’ unwillingness to stand up to the Israeli government? The Israeli government is not worried about the US Congress or any western government. However, they are worried about grassroots boycott, divestment, and sanctions (BDS) movements that are challenging their impunity. We can use this concern to nonviolently raise the cost of an attack on Iran, and thereby help prevent the next large-scale war in the Middle East. 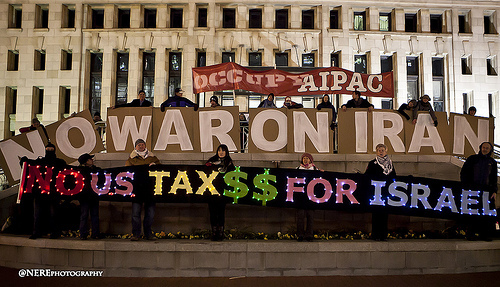 By signing the Divest From War Pledge, you commit to boycotting Israel and Israeli products, and divesting from Israeli government bonds if Israel initiates a preemptive attack on Iran. This is a global campaign, and all peace-loving people around the world are encouraged to sign this pledge. How is this different from other online petitions? Most online petitions ask an elected official, corporation, or other entity to do (or not do) something, but usually there is no added incentive, other than bad publicity. In this case a serious incentive in the form of a threat of boycott/divestment is built right into the petition. This is the kind of campaign that governments will pay attention to, but only if we get a large number of signatures! After you sign the pledge, please spread the word to your friends, family, coworkers, and any mailing list that you are a member of. Click here to download a printable (3 per page) handout in PDF format, great for taking to meetings and leaving in public places. Please check out our latest video on Nike's last-minute boycott of the Iranian soccer team, two weeks before the World Cup -- pandering to Trump. We would like to thank Counterpunch Magazine for listing us as their Website of the Day on 14 August 2012.